Optional Add-On Pockets for Cards, etc. 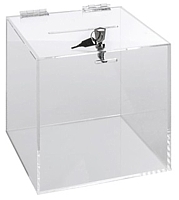 MisterPlexi Carries a Wide Variety of Sizes and Styles of Clear and Colored Acrylic Ballot/Comment Boxes. We have Locking and Non-Locking Styles. Our Ballot / Comment Boxes Can Be Used for Contests, Voting, Donations, Comments, Suggestions and More! Manufactured from Sturdy Acrylic or Similar Materials, Our Ballot Boxes are Durable and Built to Last.